This past weekend, I impulsively invited myself to tag along with a group of pals who were setting off for a 3-day ski weekend in the Hudson Valley. My plan: to knit my head off and catch up with all y’all in our Bang Out a Sweater knitalong. I wasn’t going to be driving or cooking, which already put some gas in my knitalong tank. But there was a kicker: I also wasn’t going to be skiing, skiing being a Thing I Don’t Do Well and Therefore Don’t Enjoy. Instead I would be home with the dogs, by the fire, gracefully swooshing down the indigo slopes of the shoulders of my Calligraphy Cardigan in Rowan Denim. My plan worked! I ate good cooking cooked by others, I tromped around a little bit on mud roads of Columbia County, and I knit until I was blue in the hands. 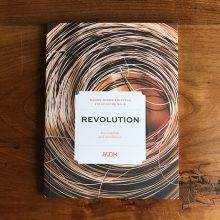 These notes are for the few, the proud, the knitters who are banging out their Revolution sweater in Rowan Denim (high-five, Wanda! fist bump, Susan!) and also for denim-curious bystanders. 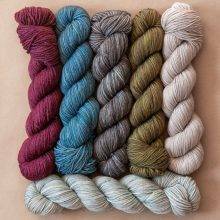 Recap: because Rowan Denim is meant to be washed and dried after knitting, and will shrink 15-20% in length, when using this yarn to knit a pattern that was not designed for it, you have to add 15-20% in length. The principle I go by is to distribute that additional length between shaping points. You can’t just add it all to the bottom of the sweater, because that would make the yoke is a bit too short and raise the armholes above their intended spot on the wearer’s body. Norah’s pattern for the Calligraphy Cardigan makes this easy to do, because it tells you measurements to knit to for each major section of the sweater. All you have to do is make each section 15-20% longer than the stated measurement. 2 extra rows after the cable chart was completed, before working the short rows. 4 extra rows before working the increase round. 8 extra rows after the increase round, before the division of the sleeves and body. Now that I’m on the body, I’m adding 2 rows between each of the increase rounds for the hips. At the end of the increases, before I get to the hem ribbing, I’ll measure to make sure the overall length is 15-20% longer than the pattern specifies, and add some rows there if needed. Adding extra length is a snap. But it does slow down one’s knitalong progress by 15-20%, which means that in a fair world, denim-knitters should get an additional 5.6 days to cross the finish line. 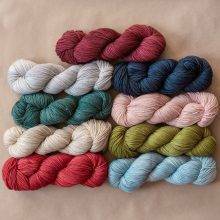 Join us in our glorious quest to knit a cabled yoke sweater this month! The mathematician in me feels compelled to point out that adding 20% does not compensate for losing 20%, since you are adding 20% to a different number than you are taking it away from. Say that your wormhole is supposed to be 10 inches. Add 20% of 10 (2 inches) to that so you knit 12 inches. But then your shrinkage is based on 12 inches, not 10. You lose 20% of 12, or 2.4 inches, leaving you with 9.6, not 10. Having said that, your sweater is beautiful, and since the shrinkage isn’t an exact science, I am confident that it will all work out in the end. I just had to get the math part off my chest! Armhole, not wormhole. Regular math probably doesn’t work for wormholes. I was really hoping for a wormhole! The shrinkage is indeed a range, and I’ve always gotten a sweater I like using this system. One would not be wise to adapt a pattern for a closely fitting or tailored garment to Rowan Denim. When I saw wormhole I thought that I’ve got to knit this sweater! That reminder is so helpful to me, the math naive, for future reference. Thank you very much. Back to my wormhole…I like that term. Your row gauge also comes into play here as well? I really go by length measurements and don’t pay much attention to my row gauge. For example, if pattern says to knit 2 inches, I knit 2 inches. Then to figure out how many rows to add for shrinkage, I calculate how many rows are in the 2 inches and I add 10-20 percent of that number of rows. For example, I had 12 rows in my 2 inches (which is bigger/looser than the pattern’s stated row gauge), so 10 percent would be 1.2 rows and 20 percent would be 2.4 rows. I added 2 rows to account for shrinkage because it was within that range. Just curious – from reading Karen Templers comments on row gauge, doesn’t ignoring row gauge make things a bit tricky re shaping placements? Not really, in a sweater where there is such minimal shaping. Not in my experience/opinion, anyway. Fist bump Kay! I moved right from the cables into those short rows without adding anything there; that will probably be fine, right? I think so. I’ll add a couple more rows before and after the increase row to make sure the armhole is long enough. I have two words to say about Rowan Denim in black: Ott Lite. Yes, I think you are fine. 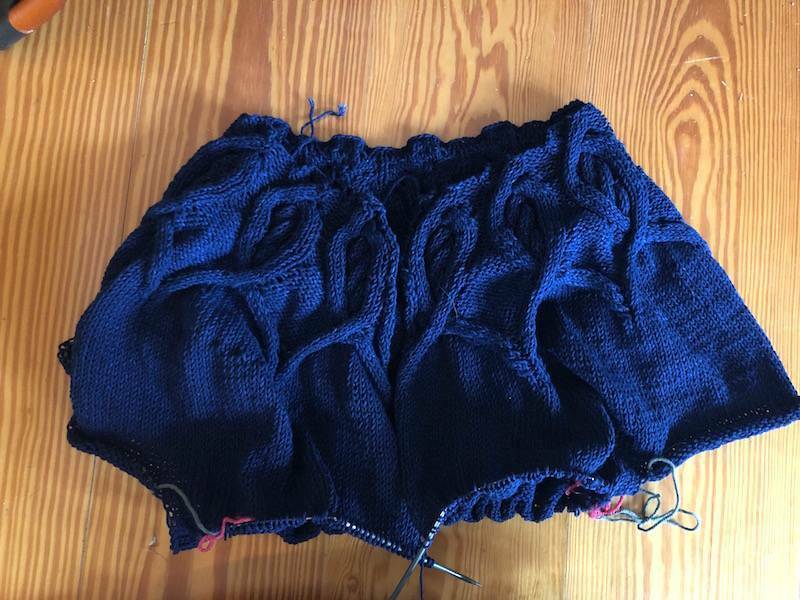 The real point of demarcation is the armhole. LOL re Ott Lite. I can’t wait to photograph this yarn after washing. You can hardly see the cables in photos of unwashed denim. Beautiful color and work. Good math, too. Soooo – here’s how it is going for me. As I try on my calligraphy (pullover version), I see that I perhaps went with one sweater size smaller than I should have. This is ok – I’m a loose knitter for one, and also I don’t mind if the sweater has zero ease. But – as I try it on, my cast-on neck sits pretty high on me – it looks like a mock turtleneck. This happens to be a look I really like! So, all good with that. However, the cabled section has also ended rather high – it hits at approx. my collarbone. Also, no problem, I figured – I’d just need to add many more inches before dividing for sleeves. Though I knit my fingers blue this weekend, I still seem to have a sweater top that is sitting too high on me to divide for sleeves just yet. Hmmmm. 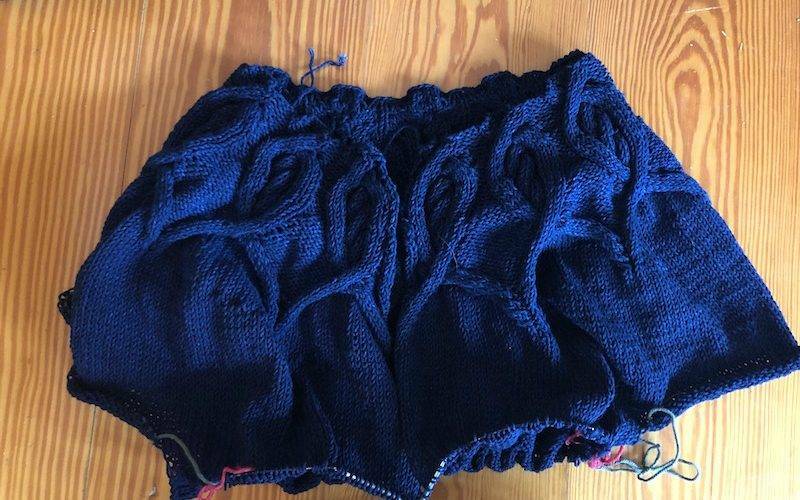 Anyway, at this point, I’m ‘guessing it up’ – I just keep trying it on periodically, and when it seems to be a length that is ‘a fair amount past where armholes should go’, then I’m going to divide. Yes of course. 🙂 And even with that extension, I may have to accept a lower grade – I’m thinking I may not pass this in until about Feb 45! I am knitting the swirl topper cable pattern using Rowan denim. This is my first cotton project that isn’t a dish cloth, and my blue hands make me feel even more like I am in the thick of the creative process! 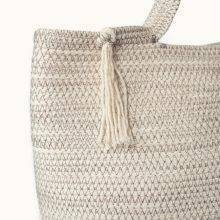 Does anyone know how to prevent the holes that occur when transitioning from purl to cable to purl? They still show up on my washed swatch, although a little less obvious. Wool is a little more forgiving, I find. I also appreciate any other technique hints for cotton knitting! It will be ok. The holes do shrink and then with wear they kind of melt. I don’t know how to describe it better but I had the same holes on my Whitby pullover, which is very heavily cabled all over, and they are not visible now. The cotton yarn is a little rigid compared to wool and I think it takes a little more time to soften up those holes. I love what you said about the blue hands, it’s so correct. I really feel like I’m Doing Something when I’m knitting with denim. Michelangelo must have been covered head to toe in marble dust, right? Thanks Kay! I’ll press on knowing that this holey sweater will close up. Onward! After reading your comment, Victoria, I examined both my Calligraphy Swatch and my Whitby sweater. Before washing, both of them had holes at some of the larger cable twists. But after washing: no holes. I have small one hole in my Whitby, right in the top of the glorious center cable, on the front. :\ But I’m pretty sure that was a dropped stitch that I didn’t notice when I was knitting it. I try to just feel lucky it didn’t drop down very far. Thanks for your advise. This is my first denim experience. I am planning to wash and dry after reaching what I hope is my armhole length. I figure I can add or rip back, if things are really off. Perhaps knitting a large scale tension gauge swatch and then washing/drying it to test for actual shrinkage is in order. Knit a scarf first. It won’t matter as much if it shrinks unexpectedly. I personally would NEVER machine wash ANY hand-knit item. I hand wash everything in cold water with Dawn dishwashing liquid, and give it a white vinegar and cold water rinse to kill microorganisms that could cause mustiness. I’ve been using this method with no shrinkage for 32 years on my finest alpaca, cashmere, silk, and qiviut projects. (Lay them out flat on a clean white towel to blot dry.) This is the only method to be sure of a shrinkage amount before starting a large sweater project. Why a dishwashing liquid rather than a wool wash, Bill? Not objecting, just curious. Bill, I hear that you have a lot of knitting experience. Maybe you are not aware that Kay has knit with and written about denim yarn. A lot. And made patterns using it. You could try looking at either of the Mason-Dixon knitting books, or doing a search for “denim” on this blog. I have found both the blog and the books helpful. This is my idea of a perfect ski trip! The perfect ski trip has zero skiing. Yes, exactly. I tried skiing about 15 years ago—easy to avoid when you live in Illinois—and hated it. Skiing probably always will be a Thing I Don’t Do Well and Therefore Don’t Enjoy, just like Kay. Slightly off topic but I bought enough black denim for a sweater for either my husband or me. He loves cotton more than wool. Maybe will Whitby in his size and share, but I love the help here. Also loved the wormholes—lots of them in my knitting I think! Whitby is glorious and your guy should have one, I say! (Also it’s fun to knit, no harder than any other cable design, just a lot of it.) But another wonderful one is Sunday Best by Rowan. I also love the Cornish Knit Frock by the Gotteliers, in the same book as Whitby. He will look like an authentic Cornwall fisherman. Oh my gosh! Who knew Rowan Denim knitting could be this entertaining!! 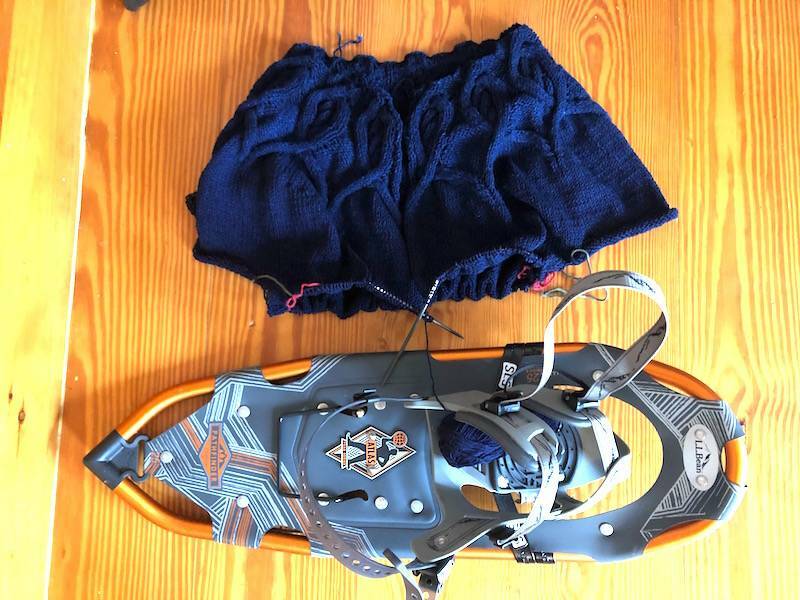 I suspect “wormhole” is now happily adopted into the MDK lexicon…that many more ski-less vacations are on the horizon, and a period of mourning is in order for the disappearance of Denim. My question: How will we live without it? OMG we are all alike !!!!! When I go to the doctor, I pray that I need to wait so I can work on my latest of 50 projects. And if they call. me in while I’m in the middle of a row WELL they just have to wait :))))) . Etc, etc, etc. LOVE MDK SITE. What is your strategy regarding the button bands? If I am expecting vertical shrinkage, how will I know I am picking up the right amount of stitches for the button bands? SUCH A RELEVANT QUESTION IN MY LIFE RIGHT NOW! Washing and drying will not only make my sweater its true finished length, but it also tidies up the edges wonderfully, making it easier to do the pick-ups. I’ll make sure I’ve got a correct number or multiple of stitches and then I’ll knit the bands per the instructions. Since I know that my washed swatch has row gauge of 8 rows to 1 inch, it will be very easy to knit a one-inch band.